As leaves gently fall…and the Monkey wonders why its gone so quiet? Update on the progress of the game and an upcoming event in 2017. All exciting stuff involving an imminent 1st Draft, Kickstarter date, and a Mega Monkey event at the 7 Hills Gaming Convention! 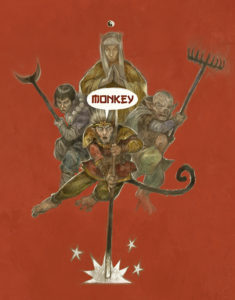 Now Crypts and Things Remastered has been released, and its add on adventures which are well on the way in the production process, my thoughts turn to Monkey as my next Kickstarter. First off I need a first draft – so I’m going to take a week off work and write it. 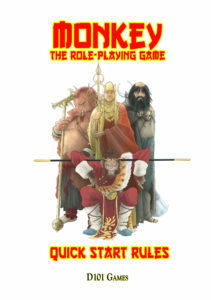 Lots of good stuff has come out of showing the very patchy “Playtest Document” to the Monkey Army folk (my thanks go to Lloyd and Neil especially on this one for some of the game changing feed back they gave me), and also my own editorial has and further research (from the films especially) has got the ideas factory in overdrive. So I need a bit of quiet focused time to pull it all together. Then its a case of get it through proof/editorial, pass it to the Mighty Monkey Army for a quick bit of feedback and then Kickstarter either before or after Xmas. Ideally I’d want the game out by April, so this event will hopefully double as a release party. If not it will be still a big fun game of Monkey, that will be unique and special. The MEGA MONKEY is going to be two tables of Monkey running side by side with space for the Narrator(s) and players to move about, partially due to the frenetic nature of the game, but also because one table will be the Western Heaven, the other will be Earth. Each table will have a Narrator and at their desecration players will be able to move between Heaven and Earth. I’ll be running the game twice over the course of the convention (Saturday afternoon and Sunday afternoon) for Eight Players each time. There will be other fun bits going on that I’ll reveal over time as the game gets developed. Note you sort out accommodation yourself. The number of rooms at the venue the Garrison Hotel is limited and by this stage running low. I’d also recommend ringing the venue directly instead of using the online booking form, because there’s often rooms available when the online version says its full. So despite the Earth going to sleep, this Monkey is very much awake and alive!